2011 was a momentous year at the movies when it came to portraying iconic figures, featuring a pair of luminous performances: Leonardo DiCaprio hypnotized as J. Edgar Hoover and Michelle Williams mesmerized as Marilyn Monroe. 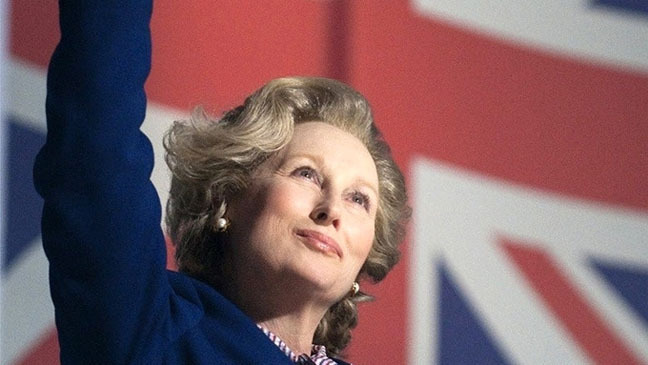 With the page now turned to 2012, it took all of days for that pair to get trumped by the historical hat trick - Meryl Streep utterly transcends acting in 'The Iron Lady' - she is former British Prime Minister, Margaret Thatcher. The film takes a non-linear approach, starting in modern day with the now 86-year-old attempting to come to grips with her life away from the spotlight while dealing with the ravaging effects of old age. Director Phyllida Lloyd (Momma Mia!) skillfully uses a series of flashbacks to travel from Thatcher's current state to her humble origins as the daughter of a grocer that doubled as their small town's mayor. 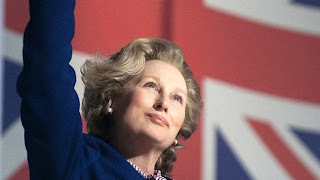 It's Lloyd's exploration of destiny and ambition that makes 'The Iron Lady' such a powerful picture, Thatcher is utterly incapable of accepting anything less than maximizing every ounce of her being - "one's life must matter" as she declares. That dogged determination to become transformative comes at a cost, sacrificing family in the name of ascension. The level of emotion attached to that sacrifice packs a weighty wallop, Thatcher's husband (Academy Award winner Jim Broadbent) superseded by her political aspirations and her twins, a son and a daughter, miss out on the most important bond of all, a mother's touch. Streep is without question one of the finest actresses in the history of film and even with a record 16 Academy Award nominations - this role is likely her crowning achievement. She deliquesces into her character, giving the ex-PM a vividly human persona, evoking an unexpected level of empathy. It's an incandescent transformation that is so rarely achieved on screen. One that should all but guarantee her a second Best Actress trophy come late February. Streep brilliantly conveying the movie's ultimate message: after all that you accomplish in this life - it's the little things that may just be our intended destinies.